On March 25, 12-24 hrs, the METOP/IASI global mean methane hit 1802 ppb at 586 mb. This same level of global mean methane was not hit until July 1st in 2013. Factors that may impact the increased speed of reaching this level is the faster thaw in Siberia and higher methane levels over Antarctica. Unfortunately, the METOP A IASI and METOP 2 both went down on or about March 26th. It seems there is a hardware issue with at least one satellite and it is not clear why the other is down as well. "On 26 March 2014, at 08.40 UTC, the MHS instrument on Metop-A entered into a fault mode during preparations for the out-of-plane manoeuvre. Attempts to recover the instrument have so far not been successful and the anomaly investigation is focusing on the possible failure of a hardware switch on the instrument. The instrument is to remain OFF until a better understanding of the problem allows further diagnostic commanding to be performed. This is not expected before mid-next week and the data service could remain off for considerably longer." It seems we are being left blind to tracking global atmospheric methane and CO2 by satellite at the moment we are proclaiming the need to do so! Tracking atmospheric methane (CH4) concentrations often gets summarized in media and blog conversations as a parts per billion (ppb) number representing a reading at a point in time, range of time, or across a set of locations. At times I have used the publicized numbers without much thought. However I discovered that while CH4 numbers were, at times, impressive (or sensational), often they do not reflect a broader reality. I had assumed I knew what they measured - and didn't. So I start with a basic question: How do we measure CH4 trends and what is it we are really measuring? Is what we are measuring "accurate" as a global or regional proxy? There are fundamental and important questions, whether tracking CH4 over the short, (days, weeks or months), recent (annually over the last few decades), or long term (centuries or over thousands of years). Even more complexity becomes apparent when we consider the collection site location, whether in the ocean, on land, or the tropics vs the poles, winds and altitudes. I have been grappling with this issue for a while, and decided to explore it. I decided to start with the key CH4 indices, such as Mauna Loa (MLO) CH4 trend data. While the graph depicts the daily/monthly readings for the entire data set, once you begin to examine the data, it gets more complex. For example, the graph depicts the flask data collected on site and re-verified by a QA process. This gives a strong sense of reliability for readings from May, 1983 up to December, 2012 - the end of the blue dots in the image above. Looking at the historical data from May, 1983 until March 1987, there is no question over the data, we only have the flask CH4 available. However, beginning in April, 1987, the in situ readings commence, and throughout the data set to December, 2012 they are usually at variance with the flask data. The variability in any given month can range as much as +/- 9.6 ppb. For example in October, 2011, the flask readings are 9.68 ppb less than the in situ reading. In November 1992, it was the opposite, the flask reading was 9.15 ppb above the in situ monthly average. The data became more mixed, when in May, 1991, the CSIRO CH4 collection commenced at MLO. With this, the ESRL flask and CSIRO readings revealed even greater variance, with the MLO flask readings being as much as 32 ppb below (June, 1991) or 26 ppb above (November, 1992) the CSIRO monthly averages. 1) It represents a stream of readings collected at the same location over an extended time period, allowing the trends to be apparent in relation to seasonal variability. 2) Its trend serves as a global proxy for creating awareness of the impacts of GHG's on global climate change. 3) Its location places it farther away from local sources or sinks, that might "bias" the data. As helpful as this information is, there are shortcomings. 1) In reality, we are only seeing the CH4 trend at one location, and at one altitude. It is a single point of data collection through time. 2) It does not provide the changes in methane globally, based upon seasonality, altitude, or sources. 3) CH4 trends at the poles are not reflected in the data. 4) In reality, depending on the device or organization, variant readings may mean that the actual needs to be some type and average of the different collection and recording methods. 5) There is no "provisional" data for near real time comparison or evaluation by the public. This means that others who have an interest in data have to wait as long as a year for access, despite the provisional being available for charting as above. 6) It is not global in a real sense, more collection points would have to be included. 1) Since we do have three data sources for the same location, not including the Scripps readings mentioned above, perhaps all three monthly readings need to be averaged as a composite reporting number, unless there is a real issue with data validity in a given period and instrument. 2) Having more provisional "real time" readings would be a real plus for monitoring MLO methane readings. This afternoon, the Scripps Observatory daily CO2 reading at Mauna Loa was 401.62 ppm, this is the first daily reading above 400 ppm in 2014. Hourly readings topped 402 ppm. This reading comes almost two months earlier than last year when the Keeling Curve first topped a hourly reading of 400 ppm on May 10, 2013. The last month's readings track the increase which will continue likely into May or perhaps early June, 2014. Through this week, readings have been creeping higher globally with the METOP-IASI global mean methane topping 398 ppm on March 11 2014 12-24 hrs UTC at 945 mb. The areas in yellow have readings above 410 ppm. The METOP-IASI tracked global mean methane hit 1800 ppbv at 586 mb during March 12, 2014, 12-24 hrs UTC. 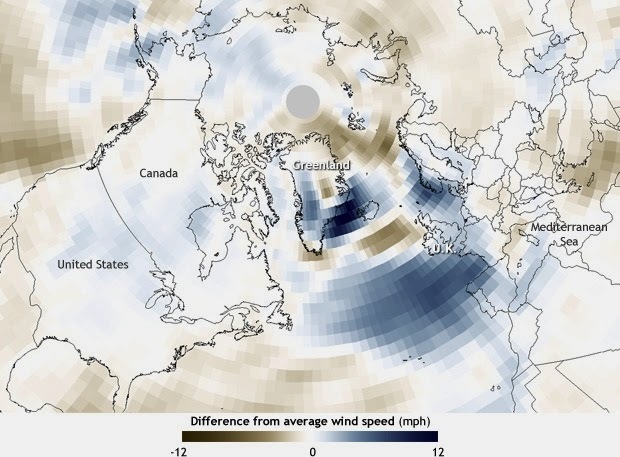 The higher concentrations are occurring, not only over the Eurasia and the Arctic, but also beginning to increase over Antarctica, as it begins to lose the sun, and winter sets in. I will comment more on particular areas in another post. During the last week, global mean methane readings have begun tracking higher than last year on a regular basis. This reading was achieved almost exactly two weeks earlier this year than last, when the reading was reached on March 26, 2013. 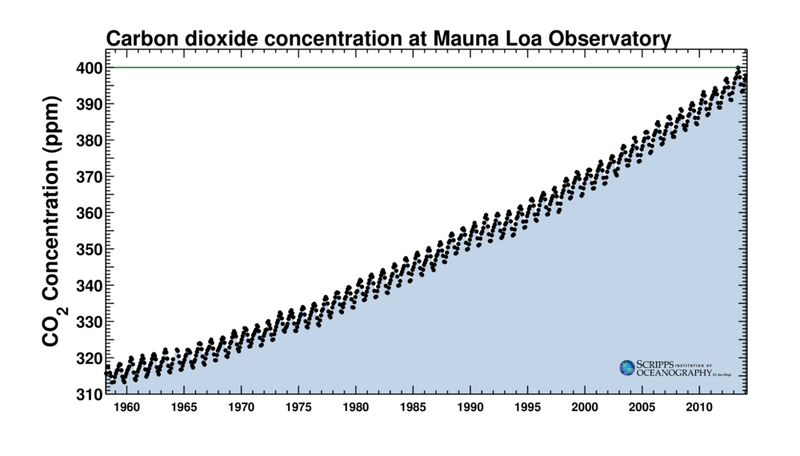 Tracking global CO2 is usually based upon the Keeling Curve readings at Mauna Loa, Hawaii, given its long tracking record. While this is very helpful, satellite imagery is providing a new perspective of global CO2 (carbon dioxide) and CH4 (methane) concentrations. One useful means for tracking global CO2 is the EUTMETSAT Metop A and B satellites which carry the IASI instrument. 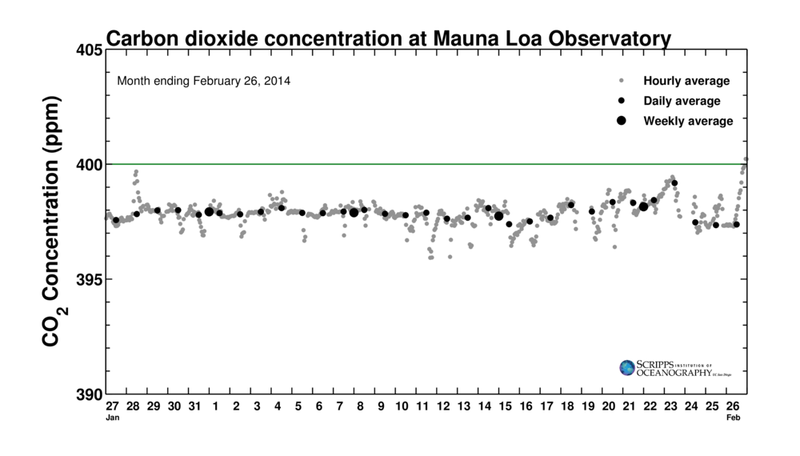 The IASI instrument enables sampling the atmosphere in 100 layers for CO2 concentrations. (More on this in another post). On March 3, 2013 0-12 hrs, the IASI CO2 global mean concentration was 395 ppm at 945 mb. What the image also reveals is that there were few areas with concentrations above 410 ppm, except in central Africa and the northwestern coast of Australia. This has changed significantly, for on March 3, 2014, with the global mean CO2 at 945 mb is now at 398 ppm, and many areas have concentrations above 420 ppm over the Arctic and North America. 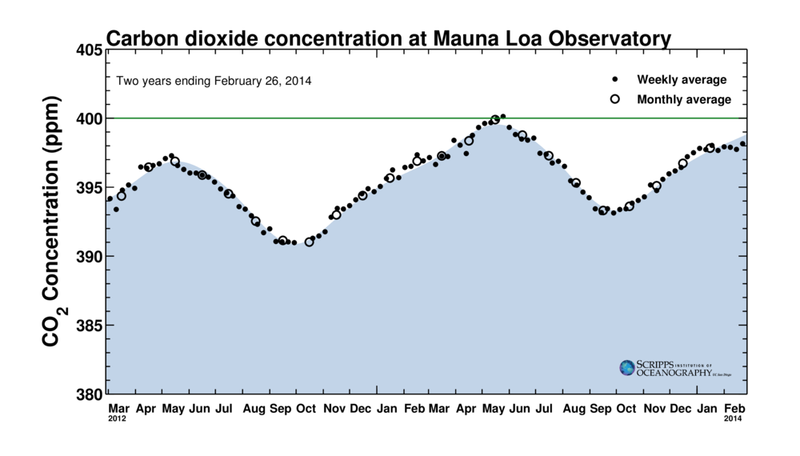 This vividly illustrates the ongoing increase of CO2 in the atmosphere over the past year. When one considers the entire atmospheric column of CO2, the mean level is a bit lower, but still captures the increase of 2014 vs 2013, and reveals that the CO2 ppm increase over 400 ppm for the entire column is widespread. It appears, for the first time this year, the hourly Mauna Loa (MLO) CO2 crossed 400 ppm during the evening of February 26, 2014. 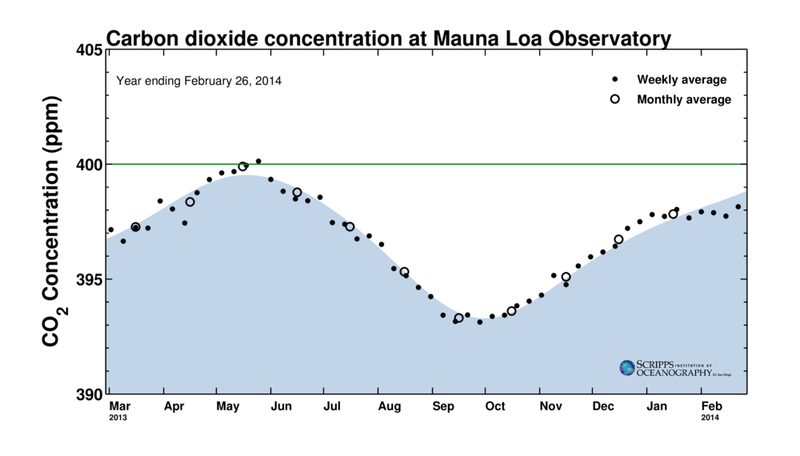 If so, it seems to put us on track for at least one week - or perhaps more - above 400 ppm at that site in May, 2014. We may even get individual days as high as 402-403 ppm if the prior year's trends hold. The instrument was down for the February 27 readings. What the next set of readings reveals will be of interest. 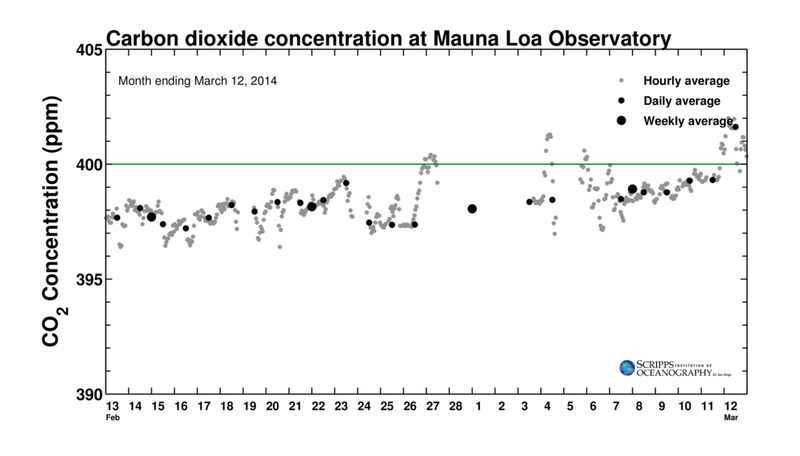 Perhaps in March or certainly in April we will have our first for day above 400 ppm for 2014. Daily and weekly readings have been creeping up through the last month. We will likely have our first week of readings above 400 ppm some time in May. Glancing at the above annual CO2 readings at MLO, it seems that we are easily 1-2 ppm above last year's weekly averages. That is more readily apparent when we have two years of readings as portrayed below. 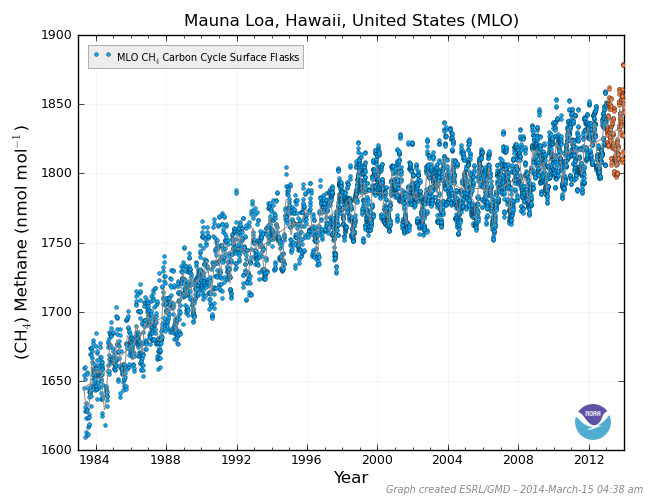 The rate of annual increase between December 2013 from 2012 ranged between 2.3-2.5 ppm. The entire set of readings by month since the records began in 1958 are below. There has been no slowdown in CO2 increases in the past 56 years and none seems coming soon. While a focus on the CO2 record at Mauna Loa is helpful, in reality many locations are reporting above 400 ppm this winter. 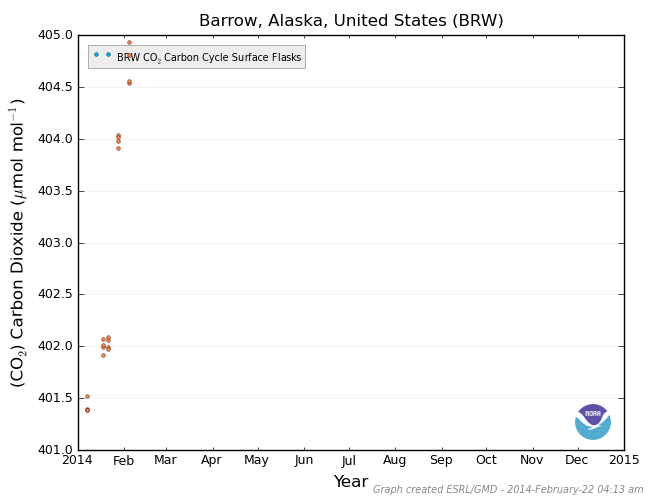 For example, the Barrow, AK CO2 readings reached almost 405 ppm in January, 2014. In individual atmospheric layers, the actual readings in these areas may be much higher, but the METOP reporting has restricted the highest readings to 420 ppm. Although the entire mean is 396 ppm, it is only a matter of time before we cross 400 ppm level globally.